Vadalur , a small town 10km from Neyveli is a spiritual place. In the great Tamil land, which gave rise to so many Saints and scholars, Vallalar is a unique person. Through out his life he advocated compassion towards fellow living beings. He preached people to lead a Vegetarian life and killing of Living beings such as Goats and Hens as the Greatest sin. In 1867, Vallalar thought of giving his spiritual mission a lasting form. He was inspired to choose a field quite near Karunkuzzi, the place of his permanent stay called Vadalur. He named Vadalur as “Uttara-Jnana-Chidambaram” meaning “North Chidambaram of Wisdom”. Here he started his spiritual work. 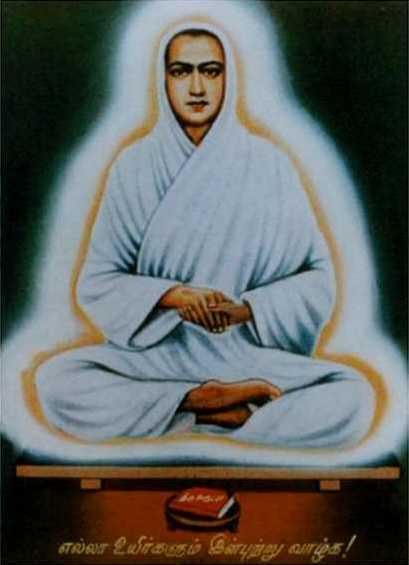 He started a “Samarasa Sanmargha” for the propagation of his ideal Universal compassion. A charity house (Dharma Sala) was started to feed the pious and the poor without any caste difference. It is said that ten thousand people were fed within three days of its starting. 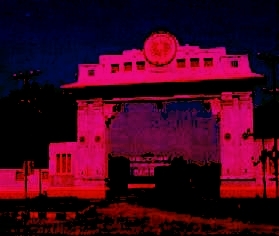 A school (Samarasa-Dharma Padasala) was started to teach students the Arul-Pa. The “True-knowledgeable-league” (satya-Jnana Sabha), an auditorium, was established to preach the spiritual ideals equally to all. The crown of his entire charitable, humanitarian, educational, devotional and spiritual service was the establishment of a magnificent temple where supreme Grace-Light, the beatific splendor was adored. It was open to all devoid of caste and religious distinction. Forty acres of land were chosen for this work in Vadalur. His disciples finished the work of this “Temple of Knowledge” within about six months. It is a beautiful lotus-shaped octagonal building, well planned for common worship. The sevenfold "Chitshaktis" (force of divine consciousness) have been represented by seven births lights with a curtain behind each. The last golden light tokens the supreme spiritual light. "Satya Jyothi" (Truth-Light) is worshipped there. “Hail Supreme Light divine! Hail Supreme Grace divine!” (The Tamil version of the Mantra is “Arulperun jyoti! Taniperum karuanai”). This is the mantra that they utter in a sweet chorus as each screen lifts up and displays the light. The hall is lively with the signing of the Arul-pa during the hour of Light display. No other ritual elaborations are allowed except the worship of Light as a symbol of divine knowledge.